First question always comes in mind is that what is fitness band and how it is helpful. Fitness bands are activity trackers, which tracks your daily activities like steps you walk/run along with distance, calories burn during your activities, sleep time etc. Apart from that few advance band, which comes with display can show you call/SMS notifications from your phone. Fitmate Z1 tracker is one of those bands, which helps you to track your activities so that you can manage your fitness. Fitmate Z1 can check your steps, calories, sleep, since how long you are idle. It also shows you call as well message notification over the display along with vibration. This SmartBand is priced ₹1799 and available on Amazon.in as well as zakklife.com. You can avail ₹100 off by applying coupon code Arvind100 on Zakklife.com. This band is priced less as compare to Lenovo or Fastrack bands with similar features. Fitness Z1 Tracker have pretty design and very good build quality. As a positive part there is no physical button on it. This tracker comes with big OLED display which can read upto 32 characters. Also Z1 trackers is water resistance, hence no need to worry about water damage. If we talk about battery than, on an average it will give you a long-lasting 5 to 6 days of battery backup. This is a wireless charging band i.e. insert your band directly into adopter and charge it. This Band is GPS enabled, so that it can track the distance accurately along with path that you travelled. To connect your phone with Z1 tracker, your phone must have Bluetooth V4.0. Apart from this if you have an android device than it must be running on Android 4.4 or above. If you have iPhone than it must be running on iOS 8.0 or above. You need to download Fitmate app from play store and sign up. Just go ahead and connect your device. After that select an activity in your band. 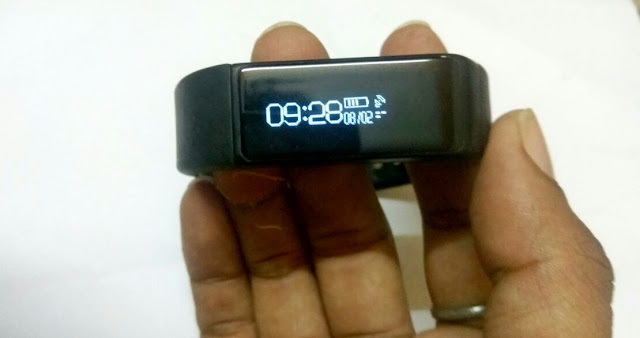 Now it will start counting and give you the results on display of band, also in app that you have installed and connected with band. I am using this band since 6 days and i found that readings given are much accurate. I am not so health freak but to test this band i took a walk of 1.5 kilometers and the readings as per band was 1.56KM, which is quite accurate. Operation of this band is also quite easy as there is no physical button on it. To find an activities, you just need to swipe and tap on display. To select an activity you need to tap and hold on display. A feature that i like most is phone finder. It happens a lot of times that we forgot our phone somewhere in room and it becomes a task to find it. Now with this band we can find our phone easily. Once we tap and hold on phone finder, phone starts ringing. Apart from these activities you will also get your call notification. When some one calls you, your band will start vibrating. You can also check the name and number of the caller on display of band. You will also get SMS notification. To read whole message, you need to tap on display. Over all this band is worth buy. OnePlus 5 Launched with 8 GB RAM, SD 835, 20 MP camera and more..